Yet more on the Il-2. 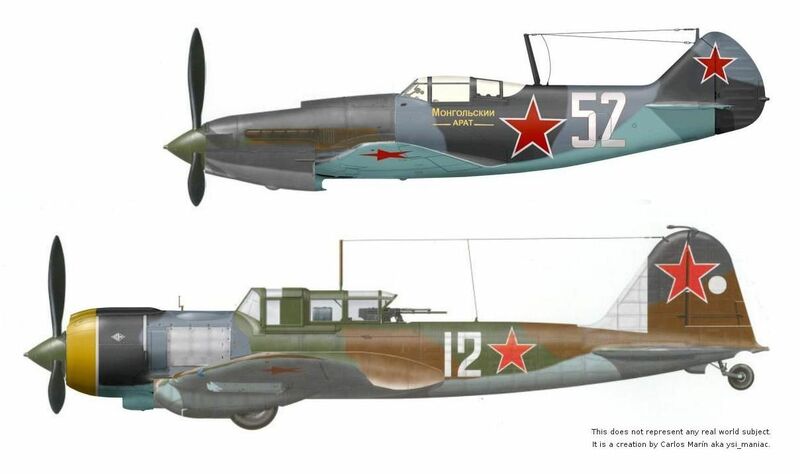 The first drawing shows a field converted Il-2 which has a turret ring for a rear gunner, but no actual turret. The second drawing and the following photo show a single seat Il-2 fitted with very large fairings for ShFK-37 anti-tank cannons. Approximately eight of these were built and sent for service trials. However the 37mm cannons were prone to jamming and this version was not put into production. The last drawing shows another variation on the radial and turret theme. This was the original proposal for the Il-8M-71 (Bsh M-71). The Il-8 was eventually built with an in-line AM-42 engine. According to the data in Yefim Gordon's Midland Counties “Ilyushin Il-2/Il-10” (highly recommended) the Il-8 AM-42 had the rear fuselage lengthened by 1.25 metres in comparison to the Il-2 and, while the wing span was the same, the wing was more evenly tapered with squarer tips and a small increase in area. (Confusingly there was also a subsequent version of the Il-8 which looked more like an Il-10 with a four bladed propeller). An IL 2 serving with the Soviet group of forces-Great Britain. Some ware in southern England June 6th 1944. The idea behind this one was Stalin wanted a piece of the action on the western front so offered the western allies the use of a shock army and supporting air power. Soviet troops go ashore in Normandy on the 6th june on what IRL was Sword beach, renamed here as Lenin beach. Its armed with American bombs and British RP's. [Here's the Defiant-turreted Stormovik A.Mk.IB as operated over Dunkirk by 264 Sqn RAF and a mid-engined V-VS Shturmovik (inspired by the Airacobra?). Well, I've been thinking of Defiantising an Il-2 with a Napier Sabre on the front end for a while. The Sabre has now been used on my '46 GB Firefly III but I may find one spare in the near future (courtesy of another project). It'll go on the Il-2, but as part of a more radical makeover. It's only in th elast week (and following some sly photocopying at work) that it has struck me how close dimensionally a Sabre Il-2 would be to a Boulton-Paul P96, so here's a long term project about to kick off! Not a whiff, but wow!